SOFRELINER TOUGH® S (Soft) delivers a Shore A hardness of 24, and up to 18-month relief of irritated tissue. For use with first time dentures, after surgery, teeth extraction, or implant procedures. Designed for applications when pain relief is the primary concern. 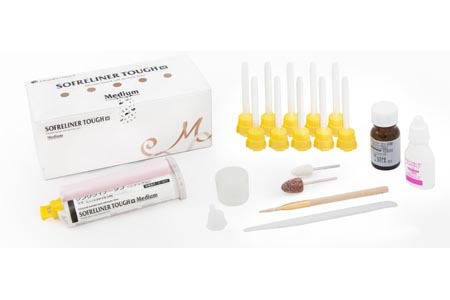 SOFRELINER TOUGH® M (Medium) provides a Shore A hardness of 43, with up to 24-month relief for patients experiencing pressure point problems, mucous atrophy, major undercuts, or improved suction. Designed for applications that require the optimal balance of longevity and comfort.